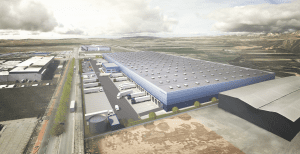 Investor developer Gazeley, has stared construction of a 520,000 sq ft warehouse near Madrid, Spain. Gazeley is undertaking the project in collaboration with Jesthisa a local developer specialising in industrial platforms. The site, to be named G-Park Guadalajara, is strategically located in the consolidated Henares industrial park north of Madrid and has direct access to the A2 and R2 highways that lead to both Madrid and Barcelona, providing excellent transport links for the distribution centre. The proximity with the city of Guadalajara gives the site excellent access to a good pool of labour. The building is striving for a BREEAM “Very Good” certificate, further underlining Gazeley’s environmental credentials and a key focus for its new developments. This project marks the second development for Gazeley since it re-entered the Spanish market, the first being a 410,000 sq ft warehouse in Illescas that is also due to complete this year.